Recently I attended a workshop on loose parts. I’ve watched children play with open-ended materials for a long time, and always believed in the value of unstructured time for play and learning. I am always glad to discover that there are even more ways to enhance children’s learning and creativity. The workshop provided a fresh view of children – as curious, capable of complex thinking, bringing rich experience to their learning, and full of tremendous potential. 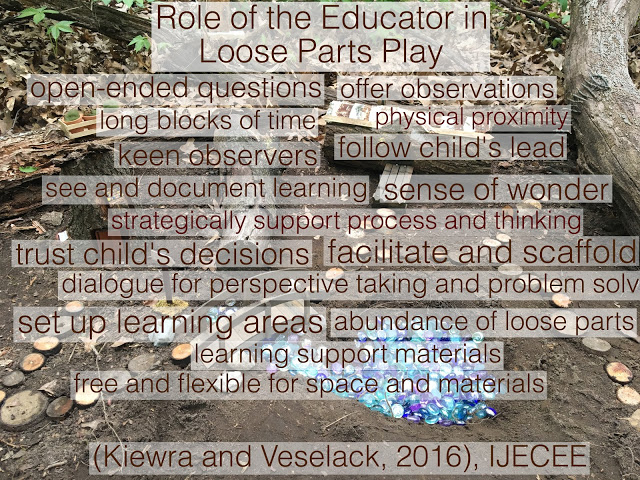 I was reminded about the importance of learning environments and the potential of play materials, and I received a renewed sense of how to approach teaching. As I played with interesting and inviting objects and ideas at the workshop, I considered ways to bring my own curiosity into play and learning experiences I share with children in my classroom. 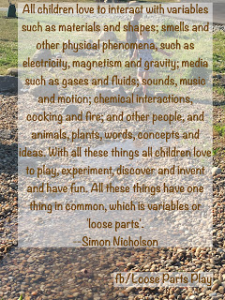 Loose parts is a term introduced by British architect Simon Nicholson to describe open-ended materials that can be used and manipulated in many ways. These are beautiful, found objects that can be moved, carried, combined, taken apart and changed; they provide unlimited possibilities for play, investigation, innovation, problem-solving, co-collaborating and creativity. 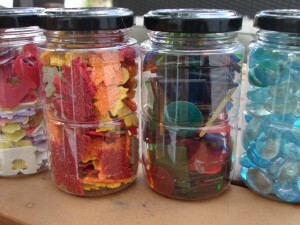 Loose parts can include nature-based items such as sticks, rocks, leaves, shells and sand; wood-based things like clothespins, dowels, golf tees and puzzle pieces; plastic materials such as buttons, bag clips, curtain rings and milk caps; metal items including washers, bangles, keys and thimbles; things made from ceramic and glass like beads, tiles, gems and prisms; fabric, yarn and ribbons; and packaging, including bubble wrap, boxes and paper rolls. The possibilities for open-ended play with these materials are endless! 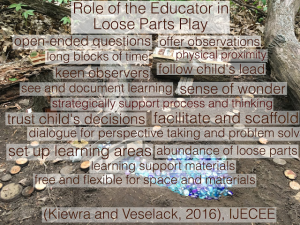 I was particularly interested in the connection of loose parts to children’s styles of playing. Daly and Beloglovsky write about how loose parts support symbolic play, whether children are imitating actions and words, using sounds or words, using objects for make-believe, or discovering the functional uses for symbolic toys. In addition to emphasizing the potential for language development, theses categories of children’s play show us the continuum of children’s cognitive abilities. Children’s use of play materials can provide rich insights into this development. Michelle Thornhill’s chart, Loose Parts and Intelligent Plaything Categorized by Schema, is very specific about the types of play being observed, what the child might be exploring, and the loose parts that best support each unique play style. For example, if a child likes to cut with scissors, knock down towers or take apart devicies, they might be exploring deconstructing. Loose parts that support this exploration might include paper clips, velcro hair rollers, spring snaps. This chart is a really interesting and useful tool for observing children’s play preferences (schemas), and for providing thoughtful play materials that encourage a deeper exploration of a particular kind of play, and as the chart demonstrates, there are many kinds. What I realized from all of this is that as an educator I have the opportunity to observe more closely, understand more fully, and respond to children with greater sensitivity. This workshop on loose parts will become a more important part of how I think about children’s play. This entry was posted in Activities to Enjoy, Arts Books for Children, Curriculum in Early Childhood, Exploring Creativity, Outdoor Play, Teacher Education, Uncategorized and tagged Daly and Beloglovsky, loose parts, play schemas. Bookmark the permalink.